Lincoln Prototype With Disappearing "Caterpillar Doors" | OhGizmo! Rattle Buster – Do You Hear That? 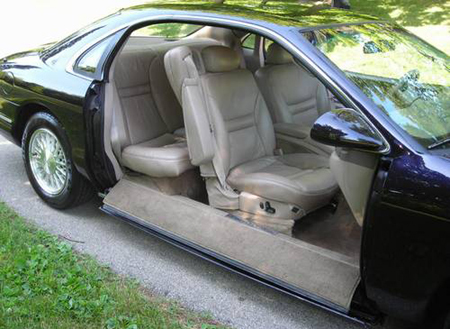 I know “caterpillar door” makes no sense, but what are you supposed to call this besides whatever the opposite of “butterfly door” is? Both sides of the car feature these doors, although currently only the passenger side is operational (via the keychain fob). The other door is kind of jammed, but could technically be kicked coaxed back into life. The rest of the car is in pretty good shape with 43k on it. Needless to say, it’s one of a kind, but it’s up for grabs right now on eBay at $20,000 (reserve not yet met). Well, you would also have a problem when the door gets stuck when it is in the up position in which situation you have to crawl out the windows.